Compare the offers of the different car rental companies at the international Airport Havana at Driveboo.com. 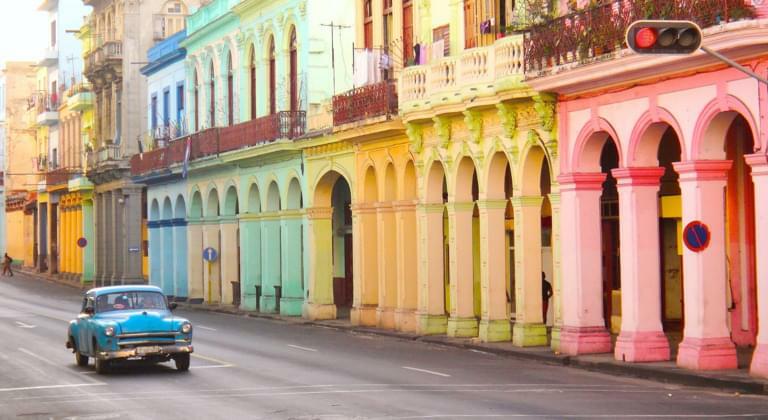 When you hear Cuba and Havana, think of colonial buildings and vintage cars in bright pastel colors. In addition, there are dream beaches, many streets with little traffic and lively promenades. Cuba with its capital is a perfect holiday paradise. But you should not be without a rental car. You can find the rental car in our price comparison. There you can find good car rental deals at the Havana Airport. What can I do after arriving at the Airport Havana? You can visit one of the numerous national parks between two days on the beach or admire the UNESCO World Heritage Site's historic city centre in the town of Cienfuegos, about 240 km from Havana. But also Havana itself has a lot to offer, so that you can start a round trip with your rental car. If the car of a local car rental company has already been provided to you at the pick-up station at Havana airport, you can go to your booked accommodation after the long flight, regardless of the taxis and public transport in Cuba, which are mostly overcrowded buses. The International Airport Havana José Martí HAV is located only 15 km from the Cuban capital and serves many flights. On Cuban roads, this corresponds to a journey time of about 20 minutes and can be reached quickly with a rental car from a pickup station at the airport terminal. Named after the Cuban patriot and poet José Martí, the airport is the country's main airport for national and international flights. From Germany the International Airport Havana is approached from Frankfurt, but you can also fly to Havana from the USA. The airport has four terminals, with international flights from Europe also being served in Terminals 2 and 3. A shuttle bus service runs between the individual terminals. Here you will also find various small shops selling books, tobacco and gifts. There is also a pharmacy in the airport building. Terminal 3 for international flights is the largest and most modern building at Havana International Airport HAV. How far do you have to go to the pick-up station for my rental car? The pick-up station for your rental car at Havana Airport is not far from the luggage belts. For example, there are various car hire companies with their pick-up points in the various terminals, most of which are located in Terminal 2 and Terminal 3. So you don't have to search for a long time on arrival and you will quickly receive the rental car. The cheapest thing about hiring a car at the International Airport Havana is that the rental companies usually have their pickup station open 24 hours a day. Depending on when your flights arrive or depart, you therefore have the possibility to pick up your car rental, which you could rent in advance via the price comparison and return it after your holiday, at any time. Since you will normally arrive at International Terminal 3 with your flight from overseas, you can also pick up your rental car directly after the baggage carousel and customs at the pick-up station in the arrival area of Terminal 3. Please note that there are no lockers at this airport in Havana if you arrange the formalities for your rental car at the pick-up station, so that you do not leave your luggage unattended. Is it possible to refuel the rental car at Havana Airport HAV? If you decide to rent a car via the Internet, make sure that you have a fully-fuelled car available at the airport when signing the contract. In Cuba and Havana, there are still fuel shortages and it is quite possible that the nearest petrol station to the airport may not be able to offer the desired petrol at the time you pick up your rental car. In general, you should also never empty the tank when travelling through Havana and Cuba, as there are gasoline shortages all over the country. The traffic connections from the International Airport Havana José Martí HAV, where many flights land and depart, are good. From the airport building via Avenida Rancho Boyeros or Avenida Van Troy you can directly reach downtown Havana. The roads are all well signposted, so you will quickly find your way with your car rental car. There is no train connection from Havana airport to the city. Only the taxis, public buses or shuttle buses of the hotels run here. So you are well served with a rental car from the price comparison Driveboo. After paying the deposit, you will quickly receive your car from the car rental company at the airport and you will be able to reach your booked accommodation without being dependent on public transport. 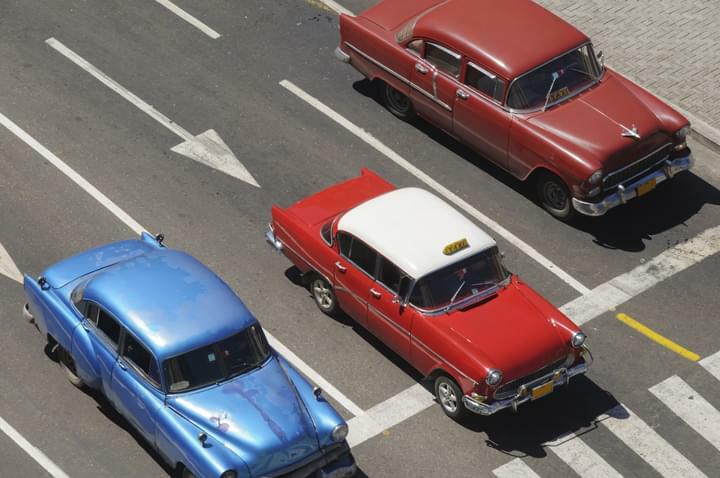 Which traffic regulations you should pay attention to in Cuba? The driver must be at least 19 years old in Cuba and in possession of a Class B driving licence for one year in order to be able to rent a car. It is helpful if you want to rent a car here, that you have an international driving licence issued, even if the national driving licence would be valid. The right-hand traffic and the international traffic rules apply here as well, which are interpreted by the locals, but unfortunately sometimes a little differently. That's why you should always drive with foresight. The maximum speed in these places is 40 km/h, which corresponds to about 25 miles per hour. Outside the towns, you're allowed to go 100 km/h, that's 60 miles an hour. However, the side roads are often not so well developed and you have to adapt to the bad road conditions and drive slower with your rental car from the price comparison, which you could rent cheaply in the Internet. But the main roads that you use to drive your rental car between the cities are all up-to-date. Driving under the influence of alcohol is not allowed at all and the police carry out regular checks, which also like to stop the rented cars. It is especially important at night when you are on the road in Cuba with your rental car that you pay attention to pedestrians. Many Cubans are still on foot in the evening and usually walk across the street.